Grave made out of bronze for Herzog Friedrich I von Schleswig-Holstein-Gottorp who became king of Denmark in 1523 and of Norway in 1524. 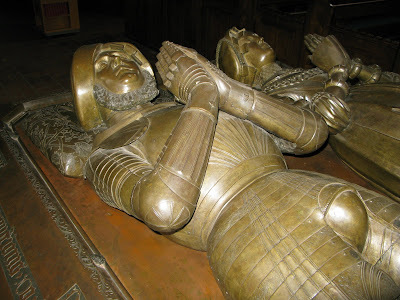 His first wife Anna von Brandenburg died in 1514 and only her remains are resting underneath this grave in Bordesholm. Photo of royal balls from Klosterkirche Bordesholm, Schleswig-Holstein, Germany, August 2008. How to bring fresh fish back home?